I remember as a kid always doing cool things through half term and thought i'd share a few of my favourite things to do during a week off. Even now as an adult when I have a week off work I book little days out and adventures for Clint and I.
I've tried to put together a list of things that are affordable and you don't have to travel very far. 1. Mini Golf / Bowling / Lazer Tag - There are some really fun activities you can do when the kids are off school. Clint and I love Bowling and Mini Golf and get pretty competitive. You can usually get good discounts and offers online so check those out before you go. You can sometimes save money by pre-booking too. 2. Theme Park- We love going to theme parks and they are a great day out for the kids, especially if they are a bit older. You can get some really good deals for Alton Towers and there's always 2 for 1 vouchers floating around. They also do offers when you stay at their hotel. 3. Go to the seaside! The nearest seaside town to Birmingham is Weston Super Mare, we love driving there in the summer to get away and chill on the sand. We bring a blanket, get some fish and chips and relax for the day. When we were younger my parents always drove us to Weston and Blackpool during half term or on a Bank Holiday and we would play in the arcade and build sandcastles and at Blackpool we would go to the little theme park and go on the rides. 4. Go to a new park, bring the bikes along and check out somewhere new. Try a new park, leave the phones at home and spend a bit of time outdoors. 5. Go to London for the day! We love visiting different cities, and it's so easy to just jump on the train. You can get some good deals if you buy an advance ticket and you usually get 2 for 1 on main attractions so check this out before you travel. We always get 2 for 1 for the main attractions in London. Check out websites like Topdogdays.com for lots of vouchers for attractions and apps like Vouchercloud or Vouchercodes for deals on food and restaurants. 6. My little cousins love to bake! This is such a cheap and easy thing to do. No matter what the weather and if you have no money you can make Cornflake cakes or brownies or cupcakes that they can decorate. The possibilities are endless and just search online for affordable recipes if you don't want to spend loads. These are a few of my favourite things to do when we have time off and I loved doing things like this during Half Term. 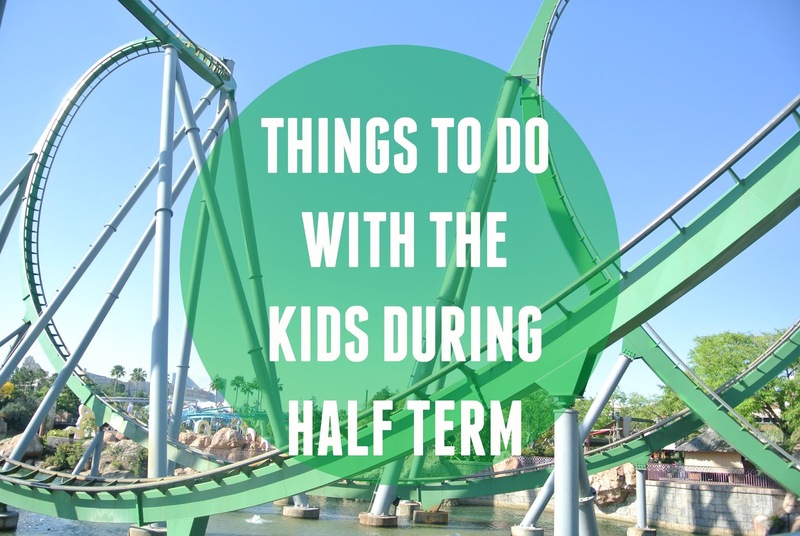 What are your favourite things to do when the kids are off school.